Decorator pattern gives us flexibility to extend the behavior of certain objects at runtime. This can be seperate than the existing instances of the same class. To be able to achieve Decorator pattern, we need to create certain infrastructure for it. Create a Subclass of the main class, also called a component, as a Decorator class. Create CONSTRUCTOR in the decorator class with importing parameter REF TO Decorator class. Set the attribute from this parameter. Redefine all other methods in decorator class inherited from Main Class. Just call the same method using the reference of the main class. Create subclass of decorator when a new behaviour is required. Redefine the methods for which we need different behaviour. We have a main class OUTPUT. We have base behavior as ALV output class ALVOUTPUT. This behavior will execute all the time. Now, we’ll add the decorator to it as per the design time consideration steps. Decorator class OPDECORATOR with attribute O_DECORATOR with TYPE REF TO OUTPUT. In the CONSTRUCTOR, we have the importing parameter IO_DECORATOR. This will set up the link between the sub behavior. Method PROCESS_OUTPUT is redefined to call the method from the O_DECORATOR. We have three different additional behavior – output in PDF, Email and Excel. This is being achieved by subclassing of the decorator and redefining the PROCESS_OUTPUT method. Along with redefintion we’ll also call the SUPER->PROCESS_OUTPUT( ) to call the previous object’s method in the chain. Actual generation of PDF, Email and Excel is out of scope for this article. CLASS alvoutput DEFINITION INHERITING FROM output. WRITE: / 'Standard ALV output'. CLASS opdecorator DEFINITION INHERITING FROM output. DATA: o_decorator TYPE REF TO output. CLASS op_pdf DEFINITION INHERITING FROM opdecorator. WRITE: /(10) space, 'Generating PDF'. CLASS op_xls DEFINITION INHERITING FROM opdecorator. WRITE: /(10) space, 'Generating Excel'. CLASS op_email DEFINITION INHERITING FROM opdecorator. WRITE: /(10) space, 'Sending Email'. CLASS op_alv DEFINITION INHERITING FROM opdecorator. WRITE: /(10) space, 'Generating ALV'. CREATE OBJECT lo_decorator TYPE alvoutput. IF iv_pdf IS NOT INITIAL. IF iv_email IS NOT INITIAL. IF iv_xls IS NOT INITIAL. At runtime, we instantiate the object and we pass the previous object as reference. Thus we create the chain. Like when we instantiate the object for PDF, we pass the reference of the base behavior ALV. When we instantiate the object for Email, we’ll pass the object of PDF and so on and so forth. The chain of object would be something similar to this. A heavy pattern, the decorator…! Thanks for your example!! I’m trying to understand the decorator for a long time now. As there are no examples of how to use the decorator in a SAP context, I still did not understand it. Your example brought me a step further on my decorator way!! I think in your example is a minor error: You do not use the OP_ALV-class although you defined it. But what I am really missing: You are not really «decorating»! In fact you use the inheritance to produce different output. Of course you use the decorator technique, but in my opinion it’s no «decorating» because «decorating» means to put “additional things” to an object. Therefore I tried to adapt your example and added costs for each output-variant. The costs will be calculated the same way you produce the ouput: At the end with ONE call of CALCULATE_COSTS. I think this describes the meaning of a decorator in a more comprehensible way?! Again thanks for your example! calc_cost ABSTRACT RETURNING value(rv_cost) TYPE wertv8. CLASS alvoutput DEFINITION INHERITING FROM output. WRITE: / 'Standard ALV output', 30 deco_cost. CLASS opdecorator DEFINITION INHERITING FROM output. DATA: o_decorator TYPE REF TO output. rv_cost = o_decorator->cost + deco_cost. 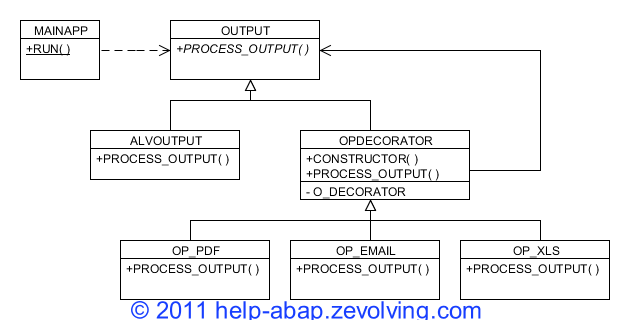 CLASS op_pdf DEFINITION INHERITING FROM opdecorator. WRITE: /(10) space, 'Generating PDF', 30 deco_cost. CLASS op_xls DEFINITION INHERITING FROM opdecorator. WRITE: /(10) space, 'Generating Excel', 30 deco_cost. CLASS op_email DEFINITION INHERITING FROM opdecorator. WRITE: /(10) space, 'Sending Email', 30 deco_cost. CLASS op_alv DEFINITION INHERITING FROM opdecorator. WRITE: /(10) space, 'Generating ALV', 30 deco_cost. IF iv_email IS NOT INITIAL. IF iv_xls IS NOT INITIAL. WRITE: / 'Total Cost:', 30 l_cost. Thanks for adding additional functionality to the example to make it more clear. We already have a base functionality – ALV Output achieved by ALVOUTPUT class. We can add more functionality to the MAINAPP, without touching existing functionality. If you think from the MAINAPP perspective, we have achieved a decorator. Lets say you wish to create another Output of your data, fancy excel using XML. So, what you do is you inherit another class from the OPDECORATOR. In your MAINAPP, you add this new object in the chain to process it. You can add new functionality (decorating) your existing functionality. More real business scenario would be any bolt on functionality to an existing program. If the designer had created decorator, it would be easier for the person who is going to modify it. As he needs to inherit a subclass, call the SUPER method in each method and finished. If you are getting confused from enhancing the existing functionality of the object (e.g. ALV, or XLS or PDF), I guess it wont be Decorator. What do you think?